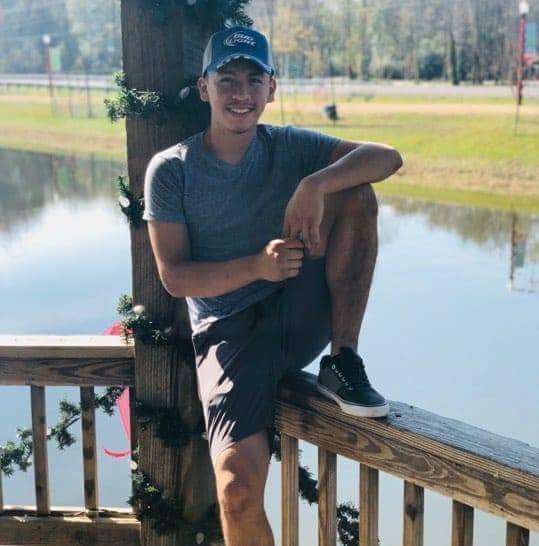 Irvin Ivan Vargas Gutierrez, age 22, passed away on March 20, 2019. He was born in Juarez, Chihuahua on January 22, 1997 to Rito Vargas Duron and Lorena Gutierrez Delgado. Kind and caring, Irvin’s heart was filled with a selfless love. With his thoughtful and hardworking nature, he found every opportunity to consider the needs of everyone: his family, friends and even strangers. He respected and ministered to people; no matter how he felt, he looked for ways that he could generate a smile and bring happiness to those around him. An exceptional cook, many times he would come home and take random things out of the fridge, using them to create a masterpiece. To Irvin, family was everything, and he devoted himself to showing his love for them. From his childhood, he started every day by waking up to tell his mom and dad how much that he loved them. He adored flowers; as a thoughtful gift for his grandmother, Maria, he would take flowers to her weekly, reminding her that he loved her. Irvin’s respectful, cheerful nature allowed him to excel as a waiter, working at Tia Juanita’s Fish Camp and Martin’s Mexican Restaurant. From tending a fish-tank to raising goats, cows, chickens and a dog, he always kept various animals and pets. Irvin had a passion for music of any kind. He enjoyed singing and was a good dancer, often coming home to turn on music, grab his mother’s hand and playfully dance with her. He was a good brother, setting an example of love and thoughtfulness for his siblings. Irvin will be missed all those that he touched with his heart, uplifted with his joyful spirit and loved deeply every day; he leaves behind the warmth and memory of the smiles that he produced and created in others. Left to honor his memory are his loving parents; brothers, Carlos Vargas of Jasper, TX, Alan Vargas and fiancé, Jessica Cano, of Jasper, TX and Rito Vargas of Jasper, TX; sisters, Sonya Vargas, Vianey Vargas and Monica Vargas all of Idaho; paternal grandparents, Santos and Maria Vargas; maternal grandfather, Manuel Gutierrez, of Juarez, Chihuahua; niece, Scarlett Vargas; nephew, Pozolito Vargas; and numerous aunts, uncles, nieces, nephews, cousins and friends. Irvin is preceded in death by his maternal grandmother, Silvestra Gutierrez. Visitation with family and friends will be 5:00 to 7:00 p.m., Sunday, March 24, 2019, at Forest Oaks Funeral Home, 601 W. Gibson St., Jasper, TX, with a rosary recitation at 6:00 p.m. Irvin’s life honoring funeral mass will be at 2:00 p.m., at St. Michael’s Catholic Church, 2898 US Highway 190 W. Jasper, TX, with Father Rossi officiating. Burial at West Oaks Cemetery in Jasper, TX will immediately follow. Irvin Ivan Vargas Gutierrez, age 22, falleció el 20 de marzo, 2019. El Nació en Juarez, Chihuahua en el 22 de January, 1997 de Rito Vargas Duron y Lorena Gutierrez Delgado. Amable y cariñoso, el corazón de Irvin estaba lleno de un amor para todos. Con su naturaleza trabajadora, encontró todas las oportunidades para considerar las necesidades de todos: su familia, amigos y incluso extraños. Él respetó y cariño a la gente; sin importar cómo se sintiera, buscó formas de generar una sonrisa y de traer felicidad a quienes lo rodeaban. Un buen cocinero, muchas veces venía a casa y sacaba cosas del refrijador, usándolas para crear una obra maestra. Para Irvin, su familia era todo, y él se dedicó a demostrar su amor por ellos. Desde niño chiquito, comenzó todos los días al despertarse para decirles a su mamá y a su papá lo mucho que los amaba. Adoraba las flores; como un regalo atento para su abuela, María, le llevó flores a ella cada semana, recordándole que la amaba. La respetuosa y alegre naturaleza de Irvin le permitió sobresalir como mesero, trabajando en Tia Juanita’s Fish Camp y enMatin’s Mexican Restaurant. Desde cuidar un acuario hasta criar cabras, vacas, gallinas y un perro, siempre tenía varios animales y mascotas. Irvin tenía una pasión por la música de cualquier tipo. Disfrutaba cantando y era un buen bailarín; venía a casa seguido para poner música, tomar la mano de su madre y bailar con ella. Era un buen hermano, dando un ejemplo de amor y consideración para sus hermanos. A Irvin lo extrañarán todos aquellos a los que les toco el corazón, se elevó con su espíritu alegre y amó profundamente todos los días; Deja atrás el calor y el recuerdo de las sonrisas que creó en otros. Para honrar su memoria quedaron sus queridos padres; los hermanos Carlos Vargas de Jasper, TX, Alan Vargas y su novia, Jessica Cano, de Jasper, TX y Rito Vargas de Jasper, TX; hermanas, Sonya Vargas, Vianey Vargas y Mónica Vargas, todas de Idaho; abuelos paternos, Santos y Maria argas; el abuelo materno, Manuel Gutiérrez, de Juárez, Chihuahua; sobrina Scarlett Vargas; sobrino, pozolito vargas; y numerosas tías, tíos, sobrinas, sobrinos, primos y amigos. Irvin es precedido en la muerte por su abuela materna, Silvestra Delgado.